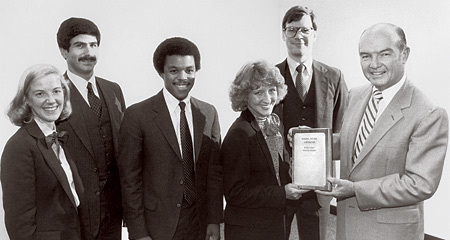 Betsy Holden '82, left, with Kellogg peers after winning the General Motors Marketing Competition in 1982. With Holden are, from left, Mark DaSila, Lawrence Benders, Mary Bolyard and Glen Madeja (all '82). Presenting the award is F. James McDonald, president of General Motors Corp.
Senior adviser, McKinsey & Co. In the early 1980s, Kellogg was on the move with palpable energy and enthusiasm. 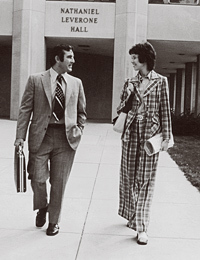 Under Dean Jacobs' leadership, Kellogg was a place continually striving to do better, willing to listen to its constituencies and to take risks and try new things. The school was moving up the rankings driven by our marketing prowess and innovations in teamwork and executive education. Students worked really hard but also had a lot of fun. We learned to identify and live our values. The quality and commitment of the faculty was impressive. I was inspired by many classes, including Stern's marketing channels, Sternthal's advertising and Kamien's economics (remember the jelly donuts!) The best educational experience I had was working on the General Motors Marketing Competition. A group of us competed against students from other top schools to develop a comprehensive marketing and media plan for the Cutlass Supreme Diesel. We had the opportunity to work with most of the marketing faculty at the time — including Kotler, Levy, Calder, Krishnamurthi — to develop our plans. To apply what we learned and to work with such experts was incredible. The only acceptable outcome was to win, and we did. The people were the greatest part of my Kellogg experience: They were smart and motivated, with diverse talents. Class projects and extracurricular activities gave me many opportunities to build relationships, learn from my classmates and develop aspects of my teamwork and leadership abilities. Back then, there was no food in Leverone Hall except for vending machines, so most of us relied on those little sandwiches from the many corporate presentations. Personal computers were just coming into use, so we had to compose everything on typewriters! Finally, these were the early days of women in business and our interviewing "uniform" was the suit, the lightly starched shirt and the dreadful bowtie. I loved my time at Kellogg and credit the business and marketing foundation that I received, coupled with the leadership, teamwork, innovation and values that Kellogg fostered, as a driver for my career. Having received so much from Kellogg, I have maintained a strong relationship with the school: Since I graduated, I have come back every year — to recruit, give a speech, teach a class, mentor students and serve on the Dean's Advisory Board. It's been beneficial to keep this Kellogg connection and personally rewarding to give back to the students and this wonderful institution. What Kellogg has done in its first 100 years is remarkable. I am committed to help make the next 100 years even better! When I enrolled at Kellogg, I had already worked at there for almost 10 years. People asked, "So why enroll in business school?" I told colleagues and friends, "I know all the titles and authors of the books but I haven't read the chapters." 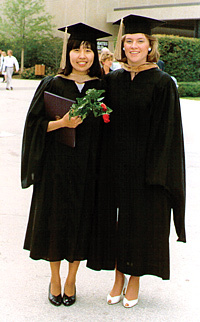 I envied acquaintances who had earned their MBA and I dreamed of the pride I would feel if I could join their ranks. At the beginning, I was scared that I would embarrass myself, that I would be the worst student. Aside from a few economics and accounting classes, I was a history major in college. I felt additional pressure to perform because I was associated with the school. I also worried about handling the load of my work and family life. From my colleagues, I learned how to balance these. In my last year, I was called to Dean Jacobs' office and he asked me to be the associate dean for master's degree programs, which included the EMP program I was enrolled in. I probably was the only student who handpicked my own professors and planned graduation logistics. I was like the principal of the high school that also was still a senior. I am grateful to Kellogg for giving me the opportunity to earn my MBA. Managing director, Kasikorn Asset Management Co. When I arrived at Kellogg, we were divided into small groups for an orientation simulation: running a corporation and making strategic decisions. My group's company went bankrupt quickly. (I'm glad to note that all the companies I have run after Kellogg have been successful and at the tops of their industries.) I found that all my professors were good, but my class section was led by Lawrence Lavengood, an ideal professor. He was kind but demanding. He encouraged us to think of all the possibilities and said that in business there is no one "correct" answer. We studied hard – sometimes until dawn. With my short, precise answers, I earned A's in most of my marketing classes. I got scared when my classmates asked for more answer books — I never asked for a second answer book! Computer labs were open then, but the user queue was very long so some of us used typewriters for our assignments. Every Friday, we enjoyed TGIF and afterward we went back to work. The balanced life at Kellogg has always reminded me to make my professional culture competitive but friendly.